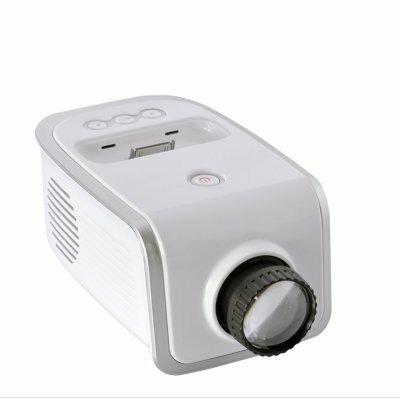 Successfully Added iPhone Dock Mini Projector "EyeProjector " - LED, 640x240, Portable Size to your Shopping Cart. Being able to watch videos on your iPhone is a great feature. But what if you wanted to watch those videos with friends or on a bigger screen? That’s where the Eye Projector comes in! Plug your iPhone in the in the dedicated 30pin connector and start projecting those blockbusters or wonderful holiday pictures on your wall or any suitable surface. Indeed, it’s that easy! No cables to plug, no Apps to install. Or use the AV IN port to plug another device. And it gets even better, your iPhone will charge while it is connected to the projector. So you don’t have to worry about missing that important phone call due to a dead battery. The Eye Projector is also super portable. Small enough to fit in the palm of your hand, take this powerful projector with you wherever you’re going to enjoy large screen projection. The LED technology used in this projector offers an astonishing 20 000 hours lamp life which means that the LED can last for more than 13 years even if you use it for 4 hours a day. Additionally, the LED light source consumes less energy than traditional lamp-based projectors and is mercury free. It’s an eco-friendly choice. This amazing LED Mini Projector is now available in stock for single or bulk order. Order a sample today and we will express ship it out to you tomorrow. Brought to you by your source of China factory direct electronics - Chinavasion.